EasyHits4u is not a typical program for earning money by clicking on ads. It is true that there is some reward for it, but rather symbolic. This is a typical page used to exchange traffic, so you can treat it as a website for acquiring referrals to other websites. EasyHits4U has been operating since 2003 and is a site with international coverage. The exchange of traffic in EasyHits4U is possible in two ways, depending on the selected ratio (2: 1 / 15s or 1: 1 / 20s). This is the amount of credits we receive after seeing each page. For the record, we get 50 credits to start, which can be used immediately to promote other websites. In addition, for every 1000 pages watched, we get $ 0.30 and additional prizes after each view of 25 pages. In addition to the standard display of pages on the entire screen, you can also use credits for text ads or in the form of banners. My sites - here we add pages to promote, set display time, targeting (what kind of users are to see the page, e.g. only from United States) and we allocate the number of credits. Buy Credits - purchase of credits, banners or text ads. Start pages - this is an advertisement that will be displayed to every user when they start surfing. This type of advertising does not use additional credits. Conversions - exchange of money, credits, banners, text ads or points - from any type to another. My Favorites - favorite. My banners - banner settings and separation of available credits between them. Buy Impressions - purchase of banner views. My Text Ads - text ads and assigning them the right amount of credits. Buy Impressions - purchase of text ad impressions. My Tools - tools to help you promote. Easy Rotator - rotator used to display multiple links alternately under one. You can put here the links of all earning websites that we want to promote, and then only use this link. Easy Splash Builder - a tool for building a simple page that we can use for promotion. We have the ability to add text, images, formatting, etc. My Offers - paid offers. Links Directory - links catalog. EasyHits4U also has a recommendation system where we get an additional% credits from invited people and one time $0.10 after viewing by the registered party at least 100 pages. We can also earn from 10 to 40% for our recommended buyer of Easy Splash Builder or Easy Rotator. It depends on what user status we have whether we bought a premium account. At the beginning, however, it does not pay to buy premium status. Only when we have a lot of referrals and active ones, can it still be although it happens differently? It is also not said our registered person will make a purchase. To order a payment in EasyHits4U you need to collect a minimum of $ 3. Payments are made within 5-7 business days. We can only withdraw money via the SolidTrustPay online wallet. As I wrote earlier, the earnings on the EasyHits4U website are not large, but we can always increase it. The first good way to do this is to look for referrals, we get $0.10 for each. Not much but also an effort is almost none. In addition, we can use credits to promote our site or gain referrals. There are pages that pay for 1000 impressions of an ad, there is no need for a rare click. This way, from these $0.3 can already do $0.5 for 1000, plus if we get somewhere referral, this value continues to grow. There are people who pay for providing traffic to your website. What we collect at EasyHits4U can promote other people’s websites. We can announce ourselves on various forums or websites, where people sell such services, e.g. Seoclerks. You probably think no one will want artificial motion? 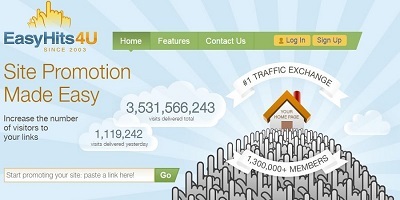 It is not true that people pay for artificial traffic to their website. For what? Ask them yourself. EasyHits4U is a good site for traffic exchange and acquiring referrals. If we know what we want to do with the acquired traffic, we can increase our earnings. Traffic can be used to promote links, so-called paid to promote. EasyHits4U is trusted and reliable company! You can make money without having to worry about not paying out.